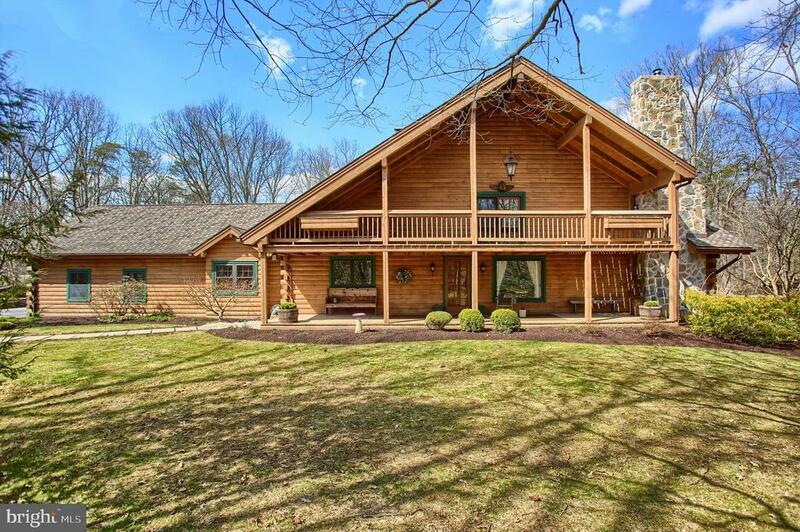 Dont miss this rare opportunity to own a log home on 15 wooded acres! Convenient location just 30 minutes to York or Harrisburg. Enjoy nearby amenities year round at Pinchot Park and Ski Roundtop. Located just North of the Conewago Creek, students attend Northern York County School District and the newly renovated Wellsville Elementary Campus. This custom built home has been well maintained with recent improvements including the roof, carpet, and brand new heat pump. The kitchen is open to two dining spaces, one of which could be used as a sitting or family room. A loft overlooks this area as well as the two story living room featuring a stone fireplace. The loft leads to a private master suite with sitting room, attached bath, and two closets. Relaxation awaits on the large front balcony. Entertain guests on the rear porch and gazebo in the yard. Property is enrolled in Clean and Green Tax Program. Come see this unique home and all it has to offer! © 2019 BRIGHT, All Rights Reserved. Information deemed reliable but not guaranteed. The data relating to real estate for sale on this website appears in part through the BRIGHT Internet Data Exchange program, a voluntary cooperative exchange of property listing data between licensed real estate brokerage firms in which Key Realty participates, and is provided by BRIGHT through a licensing agreement. Real estate listings held by brokerage firms other than Key Realty are marked with the IDX logo and detailed information about each listing includes the name of the listing broker. The information provided by this website is for the personal, non-commercial use of consumers and may not be used for any purpose other than to identify prospective properties consumers may be interested in purchasing. Some properties which appear for sale on this website may no longer be available because they are under contract, have Closed or are no longer being offered for sale. Some real estate firms do not participate in IDX and their listings do not appear on this website. Some properties listed with participating firms do not appear on this website at the request of the seller. Data last updated on 2018-05-30.